With the common mock result release arrangements , in most centers, students are denied the chance to get individual result slips, schools are simply given mark sheets, which are often delivered late, and containing so many errors. Because of the late release of results, schools and students are given very little time to analyse mocks and identify areas of weaknesses to improve upon, which is the major purpose of mock exams!!. The schools are not given analysis reports, neither do they get examiners’ comments, all that because of using weak and inappropriate systems. Often a time these systems break down after being overwhelmed by data volumes!!!. The SMIS System on the contrary is professionally built on a very strong database Engine, SQL Server, with very stable and robust Client application.It is secure, and uses passwords and accessibility limits. All areas that require careful and tedious processing have been automated thus leaving no room for human error!, there is nothing manual here, apart from data entry. For this matter, the results will be delivered well on time. Because of automation , the awarding of grades as well as derivation of best eight and division , are done by the computer automatically . This is in line with UNEB grading scheme . It therefore means that there is little room for human error . This is a great improvement to the manual system where by out of fatigue , a teacher could allocate a wrong grade to a particular student . The results will be delivered in time,this is so because most of the time consuming operations have been automated ie grading, computation of averages, positioning candidates etc. Data entry officers use passwords to access the system. The System Audit trail wizard reports any abuse of passwords by those who may alter marks. The exercise of entering marks is as simple as pressing buttons of a calculator so data entrants accomplish their work in time and with minimal effort. 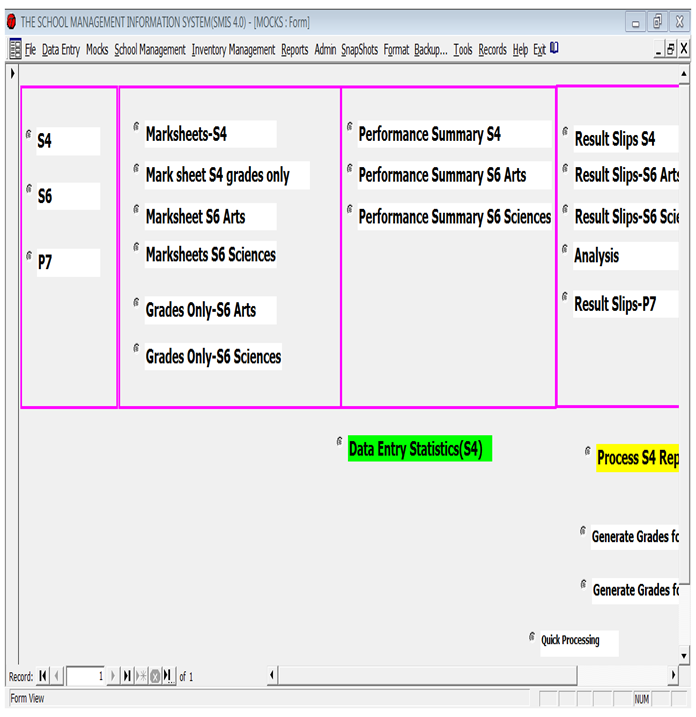 The system will be used to generate an analysis report for the mock exam performance for each school. Once marks have been entered, a mere click of a button will generate the required analysis report. System uses passwords to implement security . different options within the program are also restricted to specific users. System is multi user this means several people can enter data into the same program and hence timely delivery of reports.